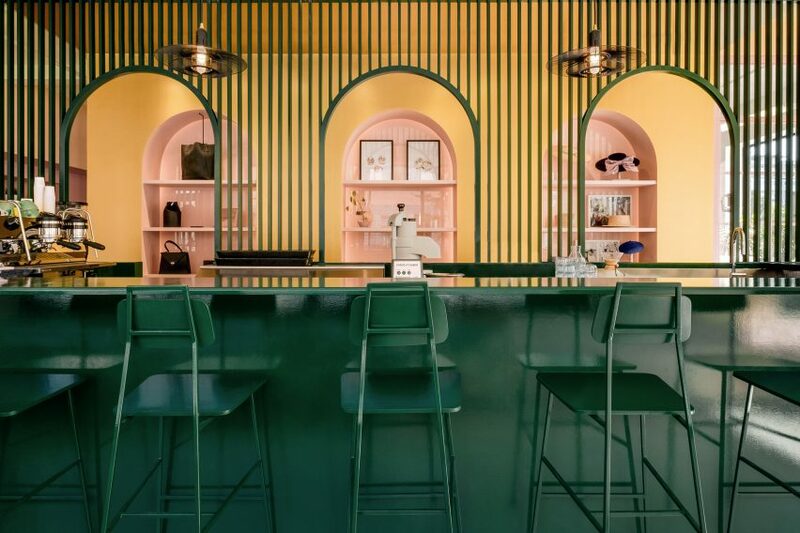 Montreal studio Appareil Architecture has differentiated spaces inside a cafe and artist workshop in the city by colour-blocking them green, pink and gold. Pastel Rita spans 1,500 square feet (139 square metres) and comprises a cafe, a boutique and an artisans' workshop in Montreal. Gabriel Malenfant and Véronique Orban de Xivry – the couple who own the space – wished to create a hybrid project, and named the cafe in honour of Malenfant's grandmother, Rita. To create the mixed-use venue, local firm Appareil Architecture renovated an empty office along a bustling street in the creative area of Mile End. Inside, Pastel Rita is decorated with several colours – each demarcating a different area. Pale linoleum flooring and ample windows help to tie the various areas together. A gold corridor runs through the centre, separated from the dark green cafe area by a slatted screen with arched openings. The arches are echoed as pink niches on the other side of the hallway, where goods designed by artists who use the adjacent workshop are displayed for purchase. In the case, a glossy green counter is surrounded by matching bar stools, which Appareil Architecture designed for the project. 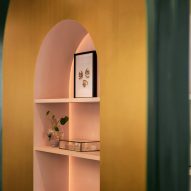 Gold continues across the ceiling from the corridor to provide a contrast in this space. Towards the back, further seating is offered in an area coloured entirely pale pink. Booths installed in nooks in the walls are partnered with tables and chairs, all in the same rosey hue. A bathroom tucked in the corner is similarly painted a single colour – this time red – where a neon light above the toilet displays "artsy fartsy" in cursive lettering. The maker space is hidden on the other side of the corridor, although windows from the seating area allow glimpses at the activity inside. This workshop has white walls and ceilings, in stark comparison to the rest of Pastel Rita, along with rustic wood and steel furnishings. Montreal's Mile End neighbourhood is home to several shops and apartments with interesting interiors. They include an Aesop store with a palette of raw materials by Naturehumaine, a falafel shop with red corrugated panelling by David Dworkind, and a renovated loft with black details by Atelier Barda. Founded by architect Kim Pariseau in 2010, Appareil Architecture has also overhauled an industrial facility into a restaurant in Montreal with exposed concrete columns and red brick walls. 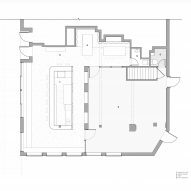 The firm's other projects in Canada are mainly residential, with examples such as a stark black cabin in the woods, a renovated townhouse, and a refurbished island dwelling. Photography is by Félix Michaud.